This weekend it is Memorial Day Weekend in the United States, this is a time we pay tribute to the men and women who have lost their lives defending and protecting our country. Before I start the blog off, I would like to take a moment to thank the people who are currently serving or have served our country, those who lost their lives during their service, and I also want to pay tribute to the families of these truly amazing people as well. Thank you all for your selfless services that you have given us. Ahh Memorial Day weekend, beaches, bar-b-ques and bright sunny skies! Okay, Okay! Not quite… we are in South Korea…yes, we do have beaches here and we did opt to head south for the weekend but not quite that far south. 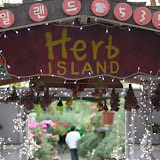 This weekend we stayed over with some friends in Songtan. 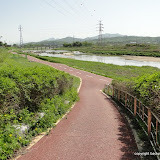 Songtan is part of Pyeongtaek and is located South of Seoul. It took us a little over 2 1/2 hours to get there but we all agreed that because we had such a great time laughing and talking that the time just flew by and did not feel like it was 2 1/2 hours. Once we arrived at our hotel we checked in dropped off our luggage and headed for a bite to eat. We found ourselves in the Sinjang-dong shopping mall area. This area is very popular for bars, dance clubs, shops, and restaurants. It is said that approximately 230,000 tourist visit this area every year. We have heard that many Americans like to visit this area to pick up handbags; custom-tailored clothing, shoes, mink blankets, DVD’s, etc. because the prices are incredibly low and can often be haggled even lower. Many of the Koreans that work in this location are bilingual or at least speak and understand some English. We were also greatly surprised that many of the businesses wanted US dollar and not won. Of course we found many American staples like McDonalds, Baskin-Robbins, and Popeye Chicken, however, there were many, many small individually owned restaurants as well. After shopping and walking all the many alleys and streets of the shopping area it was after dinner time and we thought we better make our way back to the car to head to the Italian restaurant located about 20 minutes away that Larry had recently checked out and loved. 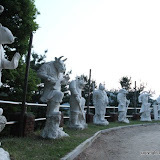 Puffins is also located in Pyeongtaek, just outside of the US military base Camp Humphreys. Our bellies were eager with anticipation due to Larry describing how incredible his meal was there. Once we arrived at Puffins we immediately loved the style and atmosphere of the restaurant. The booths have large throw pillows and the tables have Patron oil filled candles, the lights hanging are tiffany style, the walls are covered in various shots of New York and Marylyn Monroe. It really was a 1940’s American feel throughout. However, then the sweet Korean waitress approaches the table and you snap out of the daze and realize that you are still indeed in South Korea. We were impressed at the level of service throughout the entire meal. The waitress was quick and really spoke very good English. The menu is HUGE and features almost all American fair foods and drinks. I mean this menu covered everything from soups, salads, pasta dishes, to enchiladas and Quesadillas. Larry was right! This food was out of this world, delizioso! 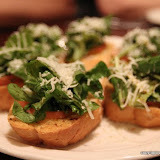 We started off with an order of Bruschetta. Note that they do bring you fresh warm bread while you wait for your meal as well. We all ended up ordering the lasagna because Larry had raved about it. Larry had a Seafood Linguine Fra Diavolo both dishes were incredible and there was no Korean twist to the dish whatsoever. We cannot wait to come back and visit Puffins again! Today I got invited with a group of friends to check out Uijeongbu and experience Budae-chigae. Okay, ha-ha have I lost you yet? Uijeongbu is a city that is located south of Dongducheon (On the train it took about 15 minutes or less to get there) and Budae-chigae is a Korean spicy stew that the area is famous for. Budae-chigae, (pronounced boo-day chee-gay) can be translated into army or military stew. This stew is typically cooked right at your table in a large pan that has the resemblance to a large hubcap (please see the pictures). This stew is shared among people and in this case we ordered three orders and still had leftovers when everything was said and done. I was told if you showed up alone and tried to order this stew they would refuse to serve you because it’s a dish meant to be shared. I’m not sure if anyone else out there finds this comical when doing a comparison to the US or not… when would a US business ever turn away a paying customer?? Traditionally this soup is spicy in taste because it is made with red pepper paste much like other traditional Korean dishes. However, we ordered two of the dishes to be toned down due to some of children and ladies preferring it that way. I personally had to try both out to see what one I favored. My choice would definitely be the traditional Korean spicy way…but I enjoy spicy foods. I wasn’t too sure to expect with the Spam. Spam really isn’t a meat of choice where I grew up, however, the spam in this soup never tasted so good! Some of the ladies in the group showed us the restaurant of the women who first cooked up Budae-chigae. We didn’t eat there because it was much smaller than the other place that we were going to. At first we were a bit concerned because we had such a large group and it was right at lunch time. When we got to the restaurant we almost turned around because the entire first floor was packed. Two ladies came running out and called for us to come back in that we could go upstairs and the kids could run around. We were thrilled! The waitress was very prompt and threw in extra rice cakes for the road. The history of the Budae-chigae dish is really what I found to be the most interesting. During the Korean War, the Korean soldiers did not have much to eat other than kimchi, rice and some other veggies. Meat was a rarity because of how scarce it was. Korean soldiers known as KATUSA’S (Korean Augmentation To the United States Army) found meats such as hot dogs and spam from the American soldiers and would make a meat stew out of it with the other things they had like them kimchi, veggies, and noodles. 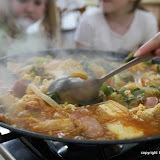 Now how is Budae-chigae relevant to the Uijeongbu area? Uijeongbu is known as the “birthplace” of this stew because of its location during the Korean War. Today Uijongbu is home to Camp Red Cloud where the US second Infantry Division is located. When walking the streets of this town you can find tons and tons of restaurants dedicated to serving up this spicy piping hot dish. Overall we had an awesome day! Made some more great new friends, got to try another traditional Korean dish, and got to sight see. It will be exciting to go back and explore some more! 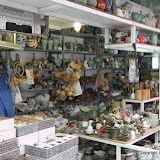 Today got to check out the shops of Insa-dong with a friend and her two girls. This area is great because there are just so many vendors and shops selling Korean trinkets that you would want to send back home for family or friends. We grabbed lunch at a Korean BBQ restaurant serving a dish called Galbi or Kalbi. Galbi or kalbi generally refers to a variety of grilled dishes that are made with marinated beef (or pork) short ribs in a ganjang-based sauce (Korean soy sauce). The meal included soon du and various side dishes (please see pictures) that you filled inside of a leaf with your meat and shove into your mouth all at once. We laughed because we have heard Americans refer to this meal as “beef-and-leaf”. Trust me this meal is delicious! After we ate lunch we also checked out the Cat Café located in Myeong-dong on the 6th Floor. This place really surprised me. I didn’t know what to really think about the concept but knew I wanted to go check it out because of its popularity among the Koreans. First, this place is VERY clean! There is shockingly no smell of cats what so ever. The litter boxes are hidden behind a door marked cat’s toilets, and there is no food served. When you first arrive you have to take off your shoes as you do in most places around Korea and put on the flip flops. You must sanitize your hands too. There is no entry free for this café but you are required to order a drink for $8,000w. The drink list ranges from cold to hot beverages depending on what you are in the mood for. The green tea lattes are super cute because they have a kitty face on them. Really, if you wanted, you could stay all day and play with these cats because there doesn’t seem to be a time limit on how long you are there. The cats are very friendly but have their own personalities. When you are there you will see some are way more active than others and some only appear when the food and treats come out (Hmmmm…. sounds like a cat we know). I have heard there is also a dog cafe but have yet to check it out. Anyone out there prefer one over the other? I think I might be a bit bias because of our love for Beanicus. Feel free to check out the pictures and comment! I met one of the sweetest ladies on the Cherry Blossom Trip and we have kept in touch ever since. Today she asked if I wanted to go for lunch with her and her sweet baby twins (One boy and one girl) to a new Vietnamese restaurant, Pho Bien, within walking distance located near both of our places. I was super excited because I have enjoyed getting to know her and her family and we have such a good time when we are together! Right off the bat we took notice and thought it was worth mentioning that this place is super-super kid friendly! They have high-chairs, booster seats, even a changing room dedicated to children with extra supplies like diapers and such for those sometimes unavoidable accidents. Honestly, from the outside of the restaurant and the cool trendy vibe we got once inside we never really would have thought this place was this kid friendly! The waiter was incredibly helpful with setting up the two highchairs, helping wheel the buggy out of the way, and getting our table started with hot tea and water. The menu has pictures of each dish as well as Korean and English translations. The menu focuses on Vietnamese Pho (of course). The dish is pronounced “fuh” and consists of noodles made from rice and is often served with Vietnamese basil, lime, bean sprouts that are added to the soup by the diner. The soup uses fresh, beef bones, whole sides of brisket and flank, traditional herbs, aromatic vegetables and skinless chicken breasts to develop a very savory broth. Once we ordered the waiter came by with Sprouts, Jalapeños, onions, and radishes for the Pho dishes. He pointed out and explained that the two sauces were for the steamed red bean buns that we ordered as appetizers. Mary and I both enjoyed our Pho dishes. Mary ordered the seafood pho and I had the brisket pho. We decided to try Tau Sar Bao (Red Bean Steamed Buns) as an appetizer that was really different but overall tasty. Most of the pho dishes on the menu ranged from $7,000w on up but note they are a large portion the both of us left much of the broth and some of the steamed buns. Overall I feel this place deserves 5 out of 5 on everything from the food to the service. We both said we really think this place will make it here! Please feel free to check out the pictures and if you get a chance to check the place out feel free to let us know what you thought. A friend and I decided to take a walk and grab lunch along the way. 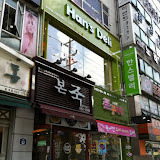 We ended up stopping in a few places but changing our minds until we saw the Han Deli sign on the second floor of a building location in New City. 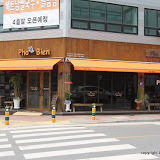 The restaurant is located conveniently close to the Dongducheon- Jihaeng train station. Woot-woot! A deli, or so we thought… ha-ha! There really isn’t anything deli-like about this place except for the name and the decor. There are no cold-cuts, veggies, or salads awaiting you to create the perfect sandwich. No, what the “deli” does feature on the menu is about a half-dozen spaghetti dishes, almost a full page of cutlets, all sorts of chicken in different sauces, and of course seafood. Don’t worry the menu features nice pictures of each dish as well as Korean and English translation. First you will be given the menu when entering the restaurant and when you decide what you are having you go to the counter place your order and pay. Once the food is ready the staff will bring the food to your table. The restaurant is more westernized with scenes from New York and had tall tables and chairs. The young girl taking the oders spoke broken english but really made an effort to try to communicate everything about the order with us. The prices are fantastic! We had the fish cutlet for $5,600w and the chicken ball Doria for $5,900w. This fish came with radishes, rice, and two decent sized pieces of breaded fish. Much to our surprise the fish was really fresh and really tasty. The chicken ball Doria was just as tasty and had balls of breaded chicken, some sort of rice with a sauce that reminded you of marinara, and cheese melted on top. We both agreed we would eat here again and try something new. We were told the menu changes seasonally so what we enjoyed this time might be gone next time depending on when we get back there again. 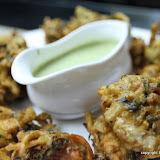 The website is http://www.hansdeli.com . I apologize in advance the pictures are from my iphone. We have to tell you about our dinner at Wawoori located in the New City area, Dongducheon, jihaengdong 684-4, South Korea. This place was DELISH! We were told a good rule of thumb to follow here in Korea is if we are unsure of how the food is at a Korean restaurant look to see how busy they are around dinner time. It was almost 20:00 and this place is packed. As soon as we hit the door to the restaurant we could smell all the good things we were about to order up. We were quickly greeted and invited into the restaurant and led to our seats by our waitress. We took notice that the restaurant featured traditional Korean style dining on the floor off to the right through an archway, as well as a section with large tables and chairs directly when you enter the restaurant. The menu was easy to navigate because it features both pictures of the dish as well as the Korean and English version of what it is. Our waitress was so sweet! She spoke broken English but was so helpful and kept checking to see how we were doing with our grill and drinks and food. Larry and I came for the duck and that is what we decided to order. We chose a platter that cost about $35,000w but really could have fed four people. The platter consisted of duck, pork belly (reminded me of juicy thick bacon), ribs, and some very good sausage, and a delicious sweet potato. The platter also comes with sides of kimchi, Jalapeños, onions, a Korean version of potatoes/pasta salad, and another side that we were not completely sure of. Larry and I were both so glad that we walked to the restaurant because we ate so much food! Although, Mmmm… now just thinking about how amazingly juicy and tender everything was at this very second makes my mouth water! We will definitely be making a few trips back to get our duck-fix. Please feel free to check out our pictures and comment. 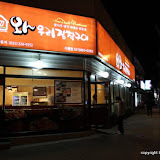 The restaurant is a chain and has a website however, it is in Korean www.wawoori.com. On our walk back home we stopped by 7gram a coffee shop. Larry ordered his usual and I tried out a sweet potato pumpkin latte. My latte was actually very good! I think this might become my regular drink of choice at 7gram.